Air France flights to Paris diverted over security scare. 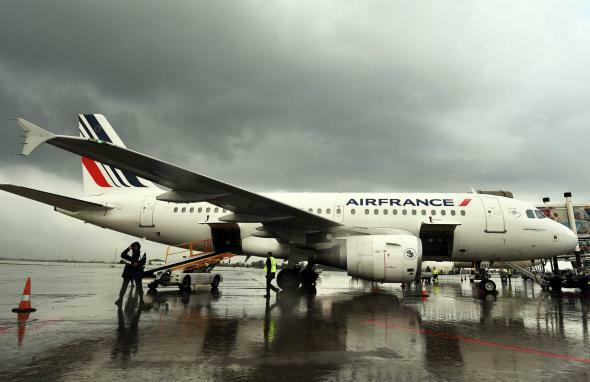 An Air France aircraft is seen on the tarmac at Houari Boumediene airport on the outskirts of the capital Algiers. Just days after the terrorist attacks in Paris, the world is still on high alert. On Tuesday evening, two Air France flights, both headed to Paris, were diverted because of reported security concerns. Air France Flight 65 left Los Angeles, but was diverted to Salt Lake City, Utah, according to an FAA spokesman. CNN is reporting the plane landed safely and the diversion was due to a bomb threat called in from the ground. *This post has been updated with new information.